The US Army’s official caption: “Survey strategy– Human Terrain Analysis Team, Iraqi Police, and U.S. Soldiers with 354th Military Police Company in support of 1st Battalion, 68th Armor Regiment conduct a full atmospheric survey in the Basra province, Iraq, July 5. Human Terrain Analysis Team, Iraqi Army and U.S. Soldiers with 354th Military Police Company conducted an atmospheric analysis to better understand the population and culture of the communities”. The year 2015 finally saw the final public confirmation of the termination of the US Army’s Human Terrain System, which apparently has ceased to be an effective reality since late September 30, 2014 (Vanden Brook, 2015). The “controversial social science program,” as HTS came to be called by the formerly enthusiastic mainstream media, has not been spared controversy even after its demise. Just a week ago, Lisa Akbari, a dual Afghan-American citizen, who had worked as an analyst for a Human Terrain Team, was gunned down in Kabul, allegedly because of her role working for the US Army (see Moylan, 2015). A couple of months before that, Wayne Simmons, a Fox News “intelligence expert” who was a “Team Leader” in HTS, was arrested and charged with fraud for lying about his non-existent CIA career—besides this, Simmons was revealed to be a former convicted felon, and is also being charged with fraud around some real estate schemes (RT, 2015). This is not to suggest that there exists no lingering praise in the media (see Harshaw, 2015)—and that too is significant, for generating some rather untenable, even bizarre theories about why HTS was ended. In other cases, what we witness are condensed reaffirmations of some US anthropologists’ criticisms of HTS (see González, 2015; González & Price, 2015; Jaschik, 2015). Nearly three years ago, my article on the end of debates about the US Army’s Human Terrain System appeared on this site, along with a collection of documents and reports that focused on the many problems that led to the decline of the program—its shrinking training classes, the termination of deployments, and what was initially a fairly serious cut in funding. Back then, it hardly seemed likely that I would ever write on HTS again, reluctant as I was to add anything further even then. For the most part, I began to see the HTS debates as unproductive distractions, from which all sides were learning very little, but from which all sides were benefiting in terms of advancing certain institutional and individual interests. Since then, it was precisely the terms of the debates in and around HTS, the historical development of their key terms of reference, and the institutional positions from which different sides of the debates were articulated, that occupied some of my attention and has been published this year in volume 11 of the International Encyclopedia of the Social & Behavioral Sciences (Forte, 2015). Here I will expand on some of that material. However, one thing I will not be doing here is to reciprocate the incoming links from online publications and blogs that produced ample, inflammatory commentary designed to bait me personally. I am already very aware of the appearance of my name in passages in several books dealing with the military and US anthropology, that for some reason chose to identify me as some sort of firebrand: “an especially outspoken opponent,” “the most vocal critic,” “unflinchingly hostile,” and other characterizations of the sort (paraphrasing from memory alone). The latest opportunity to incite an online pitchfork parade against the usual enemies of the US—intellectuals, people with consciences, those with a shred of personal dignity left—failed miserably, despite all the breathless ranting and raving. One might suspect that being in the thrall of an ideology of US exceptionalism expressed through military might, has produced severe cases of irritated bowel syndrome mixed with acute hypertension. Few, however, are interested in reading anything more about HTS, and that might be a good thing in some ways. In the meantime, thank you for those incoming links, you are doing your part for this site’s enhanced visibility. What follows is a less predictable critique not of HTS alone, but about an entire debate, one in which I participated and played a role in developing no further than should have been done. 1) The HTS program was not ended because of corruption, mismanagement, racism, or sexism—otherwise those would be suitable grounds for terminating many more military programs, such as AFRICOM. Ethical, moral, and legal explanations are thus inadequate. 2) HTS was not terminated because it was either successful or unsuccessful in achieving its stated goals. That some in the media, and on blogs, should defend the program as a success, shows just how much irrationality is produced by a generalized lack of objectivity inspired by doting militarism. That the program was largely unsuccessful in meeting its own stated objectives, is also insufficient for explaining its termination, because again such a standard could be applied to many other military programs, and even specific weapons systems that remain in use. The argument for efficacy largely does not apply. 3) HTS did not end because it suffered from three fatalities while in existence, with more injured on the job. The US Army is by now abundantly accustomed to the loss of life among its ranks. This is nothing new. 4) Anthropologists’ criticisms did not defeat the program. To suggest that, as some extreme right wing sites have done, is simply an excuse for airing self-defeating reactionary sentiments against the role of education. No academics have ever ended any US military program—and this was no exception. What is the more likely and logical explanation is that HTS was ended because the US Army chose to end it, for its own reasons. There are several other “human terrain” programs operating in the military, and in military intelligence, as we have been informed several years ago (see Forte, 2010). None of those programs recruited from academia, and virtually none have any kind of public profile in the media. However, they also competed against HTS for funding. They won. Now the US military is onto something called “human domain” warfare, which could involve a renewed push to incorporate academics (Briggs, 2015; Odierno, Amos & McRaven, 2012; Sisk, 2013). It is HTS in particular that lost favour within the institution from which it emerged. The obvious failure of the counterinsurgency gurus in the US military—patrons and sponsors of the program—helped to sink it. The spectacular failure of General Stanley McChrystal in delivering on his promises to Obama, that his counterinsurgency and troop surge would turn Afghanistan around, and then did not, likewise sank the program. The insurgents were not defeated, and that is as good as winning. While HTS proponents proclaimed they would be successful in winning hearts and minds in Iraq and Afghanistan, they were manifestly unable to win just the hearts and minds of anthropologists at home, their recruitment pool of first choice. If anything, HTS defenders and proponents, in the military and the media (assuming one can make any meaningful distinction between the two), should have won the domestic propaganda war. That they failed, is actually quite amazing and will deserve further research. HTS had every dominant narrative going in its favour: joining HTS meant showing your patriotism; the program would be saving lives; it was a way for US anthropologists to once again be relevant and useful, and to serve their country. HTS, ultimately, could help to win wars and thus bring US troops back home, while making their operations safer for them while abroad—thus supporting the troops. In pushing these sales points, HTS had the support of nearly all of the major, national mainstream media, as we witnessed a seemingly endless stream of heavily editorialized op-eds posing as “news reports”. In addition, HTS addressed certain deep vulnerabilities in the structure of expectations in academic anthropology. Working for HTS, with its extremely generous salaries—former social science directors have retired as millionaires, while others have purchased homes or paid off all student loans—was a major selling point, especially when graduates of US anthropology programs are more likely than ever to face unemployment and, essentially, poverty. To academic programs that go full steam ahead in producing more PhDs who will never be employed in academia, or who are more likely to be employed part-time—HTS stood as a giant, erect middle finger. That anthropologists made up one of the smallest numbers of social science recruits in HTS, while the discipline produced the largest and loudest number of critiques of HTS, are probably related. However, that alone did not defeat the program—HTS was obviously successful in gaining many more recruits from other social science disciplines, including those with an established history of doing ethnography. 1) Organizational: focusing on labor relations and (mis)management within HTS’ own ranks. 2) Financial: focusing primarily on issues of the cost effectiveness of HTS, and criticizing the high salaries paid and instances of fraud. Also included here was recognition of the hard realities of a shortage of full-time, if any, academic employment for those with doctorates in anthropology, and the resulting heightened anxiety within anthropological ranks. 3) Institutional: whether within organized sections of the US military or the American Anthropological Association (AAA), specific actors had their own institutions’ interests to defend against HTS. The AAA concluded that HTS was not a valid practice of anthropology. Elements in the military criticized the duplication of functions at higher cost, represented by HTS, as well as criticism of counterinsurgency doctrine, and the skewed budgets that resulted from what military critics viewed as misplaced priorities. 4) Professional: these criticisms emphasized the actual or potential harm to anthropology’s reputation posed by HTS, the potential jeopardy to anthropological fieldworkers who might be mistakenly associated as US military or intelligence agents, as well as criticizing the perceived low level of professionalism within HTS. In terms of reputation, there was also some criticism of the mainstream media’s attempt at creating celebrity status for Montgomery McFate. 5) Military strategic: doubts cast about the efficacy of counterinsurgency, its dubious likelihood of success, and the deficiencies of using civilian non-experts. 6) Methodological: critique of the research methods and theoretical models adopted as HTS standards. 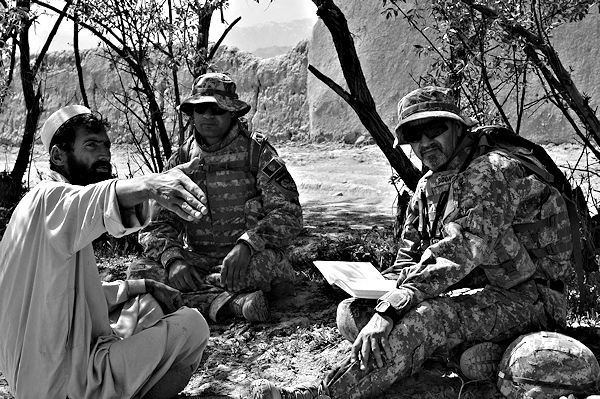 In particular, these critiques tended to dispute whether Human Terrain Teams actually did anything that could be called ethnography, as well as finding fault with the structural-functionalist models of society and culture present in both the HTS training handbook and in the US Army’s 2006 counterinsurgency Field Manual. 7) Scholarly: the quality of both the research output and the qualifications of the researchers were the focus of these critiques. 8) Ethical: in general terms this involved the passive failure to protect one’s informants by neglecting or downplaying a wide variety of basic research procedures regarding informed consent, confidentiality, and “do no harm”. There was also the accusation that HTS actively contributed to doing real harm, with reference to critiques of HTS as a “refined targeting” instrument, while also stressing its other, covert function as a means of gathering intelligence on “enemies”. 9) Political: the broadest and arguably most profound—yet most marginalized—of the critiques tended to place the HTS phenomenon within wider contexts of the militarization of the social sciences, and foreign intervention and occupation. This camp also tended to take issue with both the dominance of discussions of professional ethics in critiques of HTS. What might not stand out above, however, is the underlying unity that existed between the main lines of debate. As a result, certain opportunities were lost, as I suggested back in 2013. This is what I turn to in Part 2. Briggs, Thomas. (2015). “The Third Order Effect: Understanding the Risks to Academia from Engaging with the SOF Enterprise”. Small Wars Journal, June 29. Forte, Maximilian C. (2010). “The Pentagon’s Human Terrain, beyond the Human Terrain System”. Zero Anthropology, May 29. Forte, Maximilian C. (2013a). “The End of Debates About the Human Terrain System?” Zero Anthropology, February 17. Forte, Maximilian C. (2013b). “Documents: Investigations into the U.S. Army’s Human Terrain System”. Zero Anthropology, February 19. Forte, Maximilian C. (2015). “Human Terrain System (United States): Critique.” In James D. Wright (Ed. ), International Encyclopedia of the Social & Behavioral Sciences, 2nd edition, Vol. 11 (pp. 392–399). Oxford: Elsevier. González, Roberto J. (2015). “The Rise and Fall of the Human Terrain System”. CounterPunch, June 29. González, Roberto J., & Price, David. (2015). “The Use and Abuse of Culture (and Children): The Human Terrain System’s Rationalization of Pedophilia in Afghanistan”. CounterPunch, October 9. Harshaw, Tobin. (2015). “Army’s Anthropology Experiment Ends in Defeat”. Bloomberg View, July 15. Jaschik, Scott. (2015). “Embedded Conflicts”. Inside Higher Ed, July 7. Moylan, Danielle. (2015). “Young Afghan-American Woman Shot Dead by ‘Mullah as She Left Her Kabul Gym’.” The Telegraph, December 21. Odierno, Raymond T.; Amos, James F.; & McRaven, William H. (2012). Strategic Landpower: Winning the Clash of Wills. United States Army, United States Marine Corps and the United States Special Operations Command. RT. (2015). “Fox News’ Terrorism Expert Arrested for Lying about Non-Existent CIA Career”. RT, October 16. Sisk, Richard. (2013). “ ‘Human Domain’ Enters Future Army War Plans”. Military.com, February 20. Vanden Brook, Tom. (2015). “Army Kills Controversial Social Science Program”. USA Today, June 29. You do realize they’ve used this human map terraining with satellites and now drones over U.S. skies attacking U.S. innocent civilians for your WIlcox Kill chain? You realize this and sleep with yourselves?